After washing the fruit, hull and slice the strawberries. 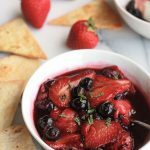 Place the sliced strawberries and blueberries on a shallow baking pan, drizzle with balsamic glaze and your choice of agave or maple syrup, and sprinkle on mint, toss to coat. Place in preheated oven and roast for 25 to 30 minutes. Remove from oven and allow to cool. Transfer to a serving dish or storage container. Store in fridge.When serving garnish with more mint. Serve over pancakes, waffles, yogurt, toast, soft cheeses and more, be creative and enjoy!